What Is Cyber ExerCycle and How Does It Work? 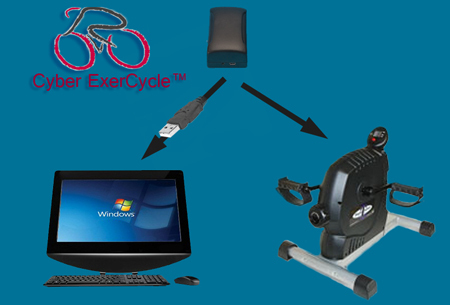 Cyber ExerCycle is a game controller for a PC. It integrates your exercise equipment with your Windows desktop/laptop or Windows tablet. 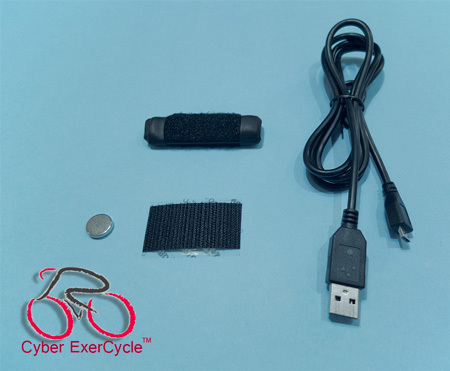 Cyber ExerCycle comes with a nunchuk style joystick used for steering (CEC_KIT_PC only). 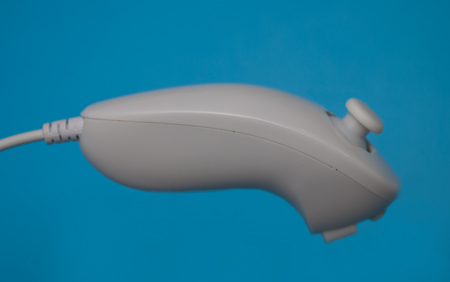 The joystick gives you a very intuitive method of controlling direction of movement. The user holds the joystick in his or her hand and steers using a thumb. Two buttons plus and controller shaking actions give you additional control inputs in the game. Works with various exercise equipment. Nunchuk style joystick with 2 ft cable. Controller box. Contains sensor connector and mini USB. Comes with a 3 ft USB cable. A USB extension cable may be added (not included with the kit). 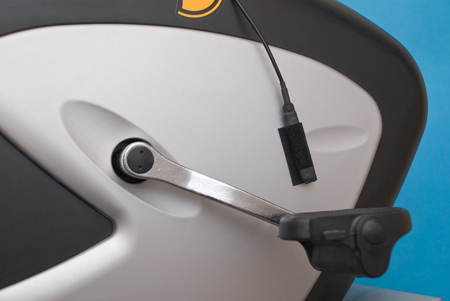 Sensor to measure pedaling speed. Includes 6ft cable and a small magnet. Attaches to the bike using velcro. Compatible with Windows XP, Windows Vista, Windows 7, Windows 8, Windows 10. 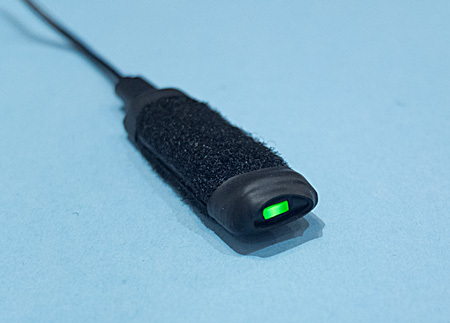 USB sensor connected through micro USB. Comes with a 3 ft USB cable. A USB extension cable may be added (not included with the kit). Sensor to measure pedaling speed. Includes a small magnet. Attaches to the bike using velcro. CEC_KIT_LITE_PC is ideally suited for games such as NetAthlon 2 where automatic steering is provided by the game. Alternatively, use this kit if you prefer to control the game using your own keyboard, mouse or game controller and only use Cyber ExerCycle to provide pedaling feedback in such games as Burnout Paradise. Attach the sensor and the magnet to the pedals of your bike. 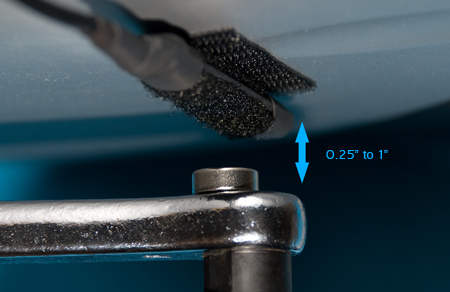 Mount the magnet so that it does not interfere with the sensor (ensure that the minimum distance between the sensor and the magnet is 0.25" to 1"). Mount the controller to the frame of your bike using velcro straps. Plug the controller into a USB port of your computer or tablet and start exercising. Joystick Mode. The controller emulates joystick. This mode is used for most car racing games. Flight Sim Mode. The controller emulates joystick. This mode is used for most flight simulator games. NetAthlon Mode. The controller emulates joystick and mouse. The interface has been specifically designed to play NetAthlon 2 racing game. Joystick is used for actual racing and mouse interface is used for game setup. Keyboard Mode. The controller emulates keyboard. All controller actions translate to button presses such as UP. DOWN, LEFT and RIGHT keys. Use this mode for some racing games and such games as Second Life. Keyboard and Mouse Mode. The controller emulates keyboard and mouse. This mode is used for such games as Oblivion, where you use keys to move a character but direction control is mostly done using a mouse. Raw Feedback Mode. In this mode joystick interface provides direct output each time the pedaling sensor is activated. 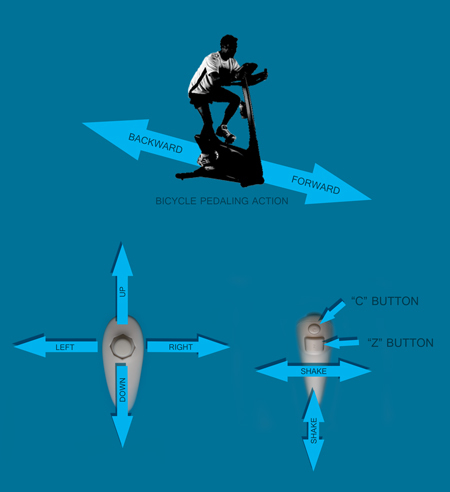 The pedaling speed needs to be calculated by the end application itself. Video Player Mode. The controller is used to control playback speed of a video player. As you pedal forward and increase the pedaling speed, the video player will increase its playback speed to reach normal playback. As you slow down the, controller will decrease the playback speed. It is great for training together with various workout videos. Joystick Mode/NetAthlon Mode. The controller emulates joystick. Use this mode for some racing or exercise games and such games as NetAthlon. Extra game controller or keyboard may be required for steering. Keyboard Mode. The controller emulates keyboard. All controller actions translate to button UP activation. Use this mode for some racing games and such games as Second Life. Extra game controller or keyboard may be required for steering. The controller allows you to configure pedaling intensity. This determines on how fast you need to pedal to move your character or a vehicle on the screen. The settings range from very easy to very hard. We have provided sample game configuration (see game section of the web site and follow setup instruction links). Adjust the game configuration to meet your individual needs. The mode and the desired pedaling intensity is configured using a simple utility installed on your PC. Once configured the controller will remember your selections even if the controller is connected to another PC. You can download the setup utility for CEC_KIT_PC from here. You can download the user guide for CEC_KIT_PC from here. You can download the setup utility for CEC_KIT_LITE_PC from here. 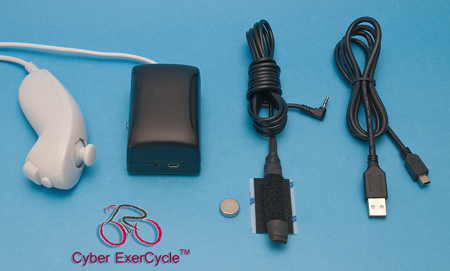 The installation of Cyber ExerCycle requires your own components such as a computer, or tablet and your own exercise equipment. Additional cables and components may be required. Cyber ExerCycle operates as a standard HID device, therefore does not require any special drivers. The controller requires USB port 1.0 or later. 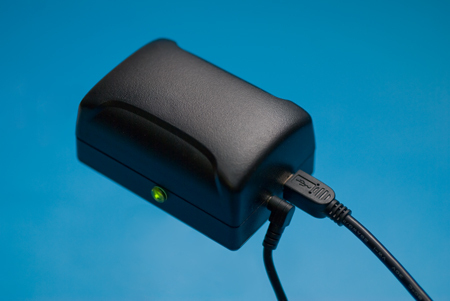 The controller uses standard USB connection to communicate with the PC or tablet. In-game configuration may be required. A simple utility may need to be installed on Windows (uses .Net framework 2) computer to configure the controller. Please confirm that your PC or tablet meets minimum requirements of the games you wish to play. Many of the games provide a free demo download, allowing you to evaluate the game and your computer performance. Please contact respective game manufacturer for game support. Windows, Windows XP, Windows Vista, Windows 7, Windows 8, Windows 10 are trademarks of Microsoft Corporation. All exercise comes with the some precautions. If you're currently inactive, it is always a good idea to consult with your doctor before jumping into an exercise program. This is especially true if you're overweight, have a medical condition, or are getting up there in the years. Also remember to warm up thoroughly before each workout. Your risk of injury drops dramatically if you spend 5 minutes warming up and lightly stretching before getting down to the serious workout. Some people may have seizures or blackouts triggered by light flashes or patterns, such as while watching TV or playing video games, even if they have never had a seizure before. Anyone who has had a seizure, loss of awareness, or other symptom linked to an epileptic condition should consult a doctor before playing a video game. Parents should watch when their children play video games. Always maintain a good grip on the exercise equipment to ensure that you do not fall during exercise. If using a hand-held controller ensure that the exercise equipment is designed for use without a need to hold onto the equipment with both hands. Limit the game play to avoid repetitive motions injuries and eyestrain. For more information, please consult user guide your exercise equipment. Also, please follow all safety precautions as indicated by the manufacturer of the exercise equipment. Copyright 2010-2016 © Universal Timer Ltd. All Rights Reserved.